This 500-Pound Lion Is Disabled. Who Takes Care Of Him And Keeps Him Safe? You Have To See This! 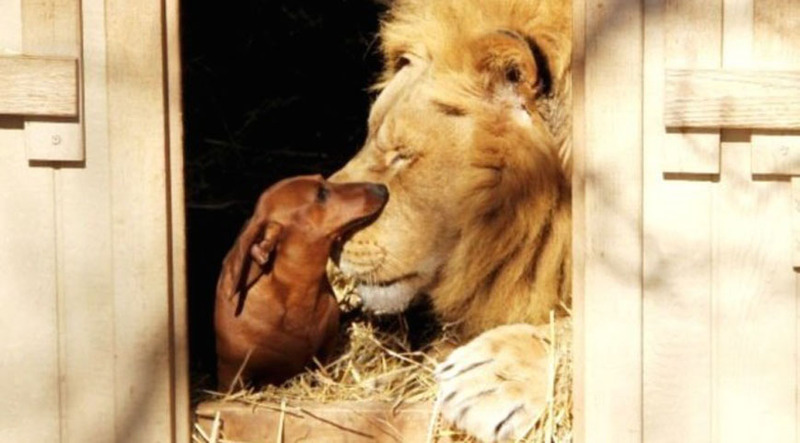 A 500-pound lion named Bonedigger is best friends with Milo, a Dachshund. Bonedigger first met Milo and three other Dachshund puppies several years ago when he was just 4 weeks old. The puppies seemed to instinctively know that Bonnedigger was mildly disabled (he suffers from a metabolic bone disease), and they wanted to protect him, according to Joe Schreibvogel of the G.W. Exotic Animal Park in Wynnewood, Oklahoma. One of the dogs named Milo especially loves to take care of Bonedigger. He cleans Bonedigger’s teeth and often imitates Bonedigger’s roars. For his part, Bonedigger gets very upset when his pride (or wiener pack) is separated from him. What an unusual and interesting interspecies friendship!